A BUEKORPS (literally Bow Corp or Archery Brigade) may, basically, be described as groups of boys who take to the streets of Bergen each spring and march to the beat of drums, flying their flags and sporting their uniforms. They are a traditional and very popular feature of the Constitution Day celebrations in the City of Bergen on 17th May each year. Bergen has in total 12 boys brigades and 3 girls brigades. The oldest of the girls brigade is Vågens Bataljon from 1991. The next is Lungegaardens Buekorps from 1994 and Løvstakkens Jægerkorps for boys and girls in the bowcorp. Løvstakkens Jægerkorps is from 1903 and started up again in 1999 with girls. 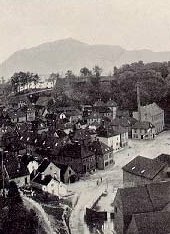 To understand how the BUEKORPS came to be, and why they have existed in their present form for almost a century-and-a-half, we need to look at the history of Bergen itself: Up to the 1880´s most Norwegian towns, including Bergen, had their own Citizens´ Guards. This was a "Home Defense" force to be called upon in times of crisis, and they had weekly marching exercises on suitable open parade grounds in town. It is possible that the BUEKORPS grwe out of this. However, we are not certain and others say that the boys brigades come from Ludvig Holbergs day’s. 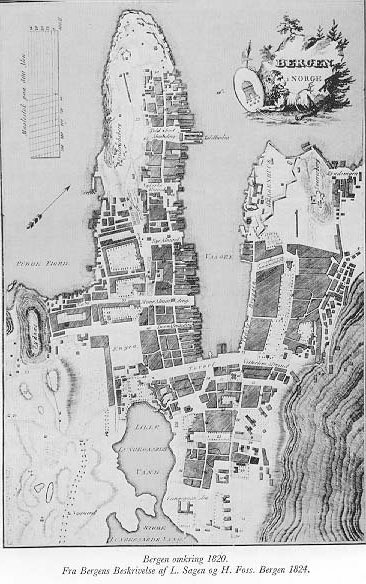 Some historical documents relating to Bergen mention oganized groups of boys, like the buekorps, as early as 1700. Other cities also have buekorps, for example Oslo, Flekkefjord, Haugesund and Ålesund. Although there is evidence that groups of boys imitated their fathers in military-like games perhaps a hundred years earlier than this, -defending their own street or home district against "hostile intruders"; the BUEKORPS as we know them today were organized by and for the young boys themselves from 185O onwards, in accordance with strict military patterns with Companies, Battalions, Platoons and Troops. The boys elected their own leaders among the oldest, fittest and most popular boys in the street; and made them officers with extensive executive authority. The movement caught on, and through the years there have been BUEKORPS in several cities and towns in Norway. Only in Bergen, however, has the tradition lived on to this day. Ardent BUEKORPS fans and supporters in Bergen claim that the survivors are those who accept´ no parental interference with internal affairs; and that the autonomy of the boys´ own leadership is what it is all about. We are not sure how many bowcorps we have had in Bergen over these past 150 years, but maybe around 200 of them. The biggest of these buekorps was Mathismarkens Bataljon in 1914- 1915 With over 500 boys in the bowcorps. Today Nordnæs Battaillon is the biggest With over 100 boys. Many of the bowcorp today have less than 50 boys and girls and that is not much. The bowcorp in Bergen celibrate “The days of the Buekorps” every four years: The next time will be in 2006. There have been a large number of BUEKORPS in Bergen, today only fifteen remain. Among them can be found several of the very first ones to be organized, and so they therefore have about 150 years of uninterrupted history behind them. They all march through the months of March, April,May and June to the uninitiated observer they still have the military character of years gone by. Many in Bergen say that the buekorps marching is a sign of spring and it drums in our heart each years. Armed with cross-bows and -mock rifles the 9-12 year old soldiers march and exercise to heavy drum-beats while the sharp commands of their elected officers in their late teens or upto 25 years old, ring out. Parading, of course, still is a significant feature of their activity, but it’s now the only remnant of the original war-and-defense game of the founders. More and more, other events, that would be expected in any organized group of young boys, have become increasingly important, both during the short marching season as well as off-season. Sports, notably soccer and athletics play a very important role, as do excursions and meetings, social evenings, members´ newsletters etc. Old boys´ societies have been formed, and on very special occasions the Veterans march with their old brigades. Recognizing the folklore value of the BUEKORPS, the local authorities and the tourist organizations make use of show platoons and drum beaters (some of whom are brilliant drummers) to highlight this very special, living traditions of Bergen.